Smart speakers have taken the consumer tech world by storm, but there's still a sense they lack enough functionality for users to treat them like everyday devices. While great for those times when you have a random recipe question or want to play music, is that all these digital home helpers really have to offer? Amazon seems to be aware that smart home products running its Alexa digital assistant must to do more to have long-term success. 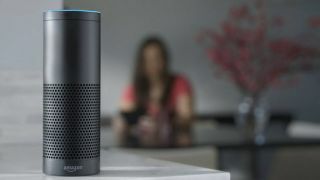 To that end, a new report from Recode says the ecommerce giant is readying at least one new device that not only taps into Alexa, but also makes voice phone calls. This functionality was reported on previously, but Recode says it's learned Amazon is moving forward with product release plans. The report cites multiple sources, and not only do they point to the new voice calling feature, but apparently users will also be able to hold two-way intercom conversations with someone on the other end of an Alexa-enabled device. Amazon's hardware is said have been in the beta testing, and an official announcement of the product or products could take place in the coming months, sources said. What's unclear is whether Amazon is introducing brand-new devices that feature voice calling and intercom functionality, or if it's planning an update to its existing Echo speaker line that includes these features. Whatever Amazon does, it will put plenty of pressure on Google Home, Amazon Echo's biggest competitor in the smart speaker space. Google is also rumored to be working on voice calling for the Home, but will Amazon beat its rival to the punch? For its part, Google Home might add the ability to recognize different users by the sound of their voices, if recently spotted code leads to a full-blown feature. Amazon, too, is reportedly working on voice print identification for the Echo and Echo Dot. Amazon's ambitions don't end there; Recode says the company has held internal discussions about an Alexa device equipped with a video camera as well. The two top dogs in the smart speaker game are clearly looking to one-up each other with new functions, all the while keeping users engaged with their devices. When and how well either company pulls off these features we don't yet know, but we get the sense it won't be much longer until we find out.